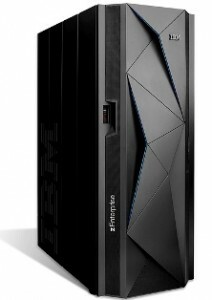 In August 2012 IBM announced the zEnterprise EC12 mainframe. The zEC12 is the biggest mainframe available from IBM and maybe too big for some customers. For those customers IBM has a new entry-level model. Meet zEC12’s little brother the IBM zEnterprise BC12. The zBC12 is powered by up to 18 microprocessors, running at 4.2 GHz which can provide up to 4900 MIPS. The new processor has 2x the amount of cache on the chip, compared to the Z114. With a larger cache structure, there is less of a need to access main memory which helps improve the performance of data serving. The BC12 also offers up to 496 GB of available memory to improve performance. Like his bigger brother, the zEC12, it has hardware support for 2 GB pages. The zBC12, with additional function available on z/OS V1.13, is able to support 1 MB pageable large pages by exploiting Flash Express. There are two models available, the H06 and H13. These numbers represent the number of configurable cores which can be configured to be a normal CP or specialty engine like a ZiiP. The H13, also provides for up to two “dedicated” spares. If you own a Z114 or Z10 then you can upgrade to zBC12. If you outgrow the zBC12 then it can be upgraded to a zEC12. In order to fully exploit the new features of DB2 11 an upgrade to zBC12 is needed. In the YouTube movie below Christy Schroeder gives a guided tour of the zBC12 and explains the technical features of the system. I love these kind of videos, maybe because I started as a computer operator (370/168) myself in the late 70’s. For those of you who still think a mainframe costs millions, the zBC12 starts at $75K.